White Moor adjoins Bolton’s Bench, to the east of Lyndhurst. One of a number of New Forest heaths of the same name, White Moors are reputedly on sandy soils, whilst Black Down and Black Knowl names are said to refer to sites on heavier, darker soils. John Wise, writing in the mid-19th century, though, hints at another explanation for the ‘black’ names, saying that bell heather (Erica cinerea) was known as black heath, so maybe places where bell heather proliferated took that name. Wise died in 1890, aged 59, and is buried in the cemetery on the edge of White Moor, which opened in the mid-1880s, just a few years before his death. 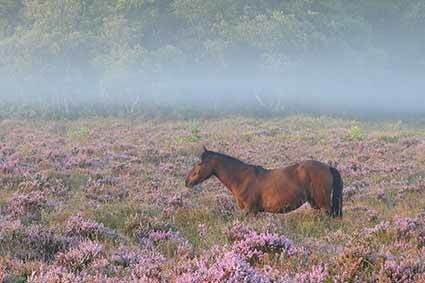 But whatever the origin of the name, on this White Moor, low lying mists gather at dusk and dissipate with the rising sun, Dartford warblers cavort in heather and gorse, stonechats ring out their noisy warnings to other Forest denizens, and adders lurk amongst the vegetation. And at dawn and dusk, red, roe and fallow deer can all occasionally be seen. Old maps tell of the Moor’s relatively recent history. Richardson, King and Driver in the late-18th century show a pattern of tracks that include one labeled as a Bridle way from Beaulieu to Minstead, and another named as the Salt Way, a salt carriers route from coastal salterns to markets inland. Peat Moor is also shown nearby, reminding of the Common Right of Turbary, the New Forest commoners’ entitlement to cut peaty turf, or turves, for use as fuel for the fire. In the 1870s, the 6” to the mile Ordnance Survey map offers a little more information, and highlights one of White Moor’s military associations - a Volunteer’s Rifle Range which is also shown in 1898, complete with Markers Hut, Flagstaff and Target, but not in 1909. Even today, however, associated earthen banks can still be seen amongst the trees at Row Hill. Notice also on the old Ordnance Survey maps, the County Police Station beside the A35, the road adjacent to White Moor. Constructed in 1857, it ceased to be used by the police in 1968 when new premises were opened on Romsey Road. The old building now houses staff employed by Natural England – English Nature, as was. The 1870s map shows the outline of both sand and gravel pits, but neither are named until 1898. Then by 1909 the gravel pit beside the cemetery had become Old gravel pit, and now is no more than a series of ash-fringed grassy bumps and hollows that betray former use. 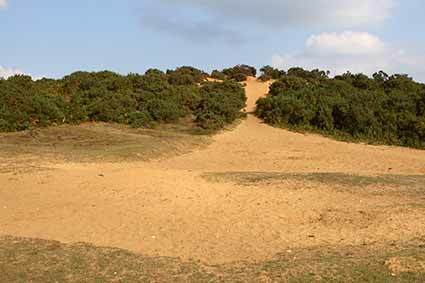 The sand pit, though, remained in operation until at least the on-set of the First World War in 1914, and today remains as a deep, pale, gorse-clad scar used as a Forestry Commission car park. Close to the site of the gravel pit, a mysteriously deep, often wet-bottomed hollow-way runs for 180-275 metres (200-300 yards) in a north-east/south-west direction, broadly parallel to the cemetery wall, and terminates at the gravel pit. In places, an adjacent, wasted earthen bank suggests deliberate excavation, rather than creation by centuries of passage. Was this associated with the gravel pit, or are its origins linked to the rubbish tip that up to the early years of the 20th century was incongruously located close to the cemetery? More probably, it is another link to military use, maybe as a First World War practice trench. And finally, the 1898 and 1909 maps show part of Lyndhurst’s golf course on White Moor. Now firmly based on the other side of the A35 Ashurst road, in 1891 it expanded from its original race ground site, and remained on White Moor until increasing road traffic eventually forced consolidation back across the road.